Due to circumstances beyond “my” control we are posting a recipe repeat this week. Reruns drive me crazy, especially when you flip through 900 channels. This rerun will bring a smile to your face though. Yes sir, the yummy Margarita. Great addition to any party, any time of the year! I am taking the month off to heal but be sure that 2018 will bring more yummy recipes to you, from me. My toast to you – Here’s wishing you a happy, prosperous, fun-filled, joyful and fortunate new year ahead – HAPPY NEW YEAR! 1. Combine lime juice, lemon juice, sugar, and salt in large liquid measuring cup. 2. Divide 1 cup crushed ice between 4 or 6 margarita or double old-fashioned glasses. Strain juice mixture into 1-quart pitcher or cocktail shaker. 3. Add tequila, Triple Sec, and remaining crushed ice; stir or shake until thoroughly combined and chilled, 20 to 60 seconds. 4. 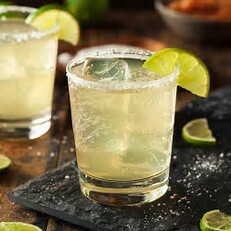 Rub the leftover lime rinds around the glass – rim with salt and pour the Margaritas mixture into ice-filled glasses; serve immediately.